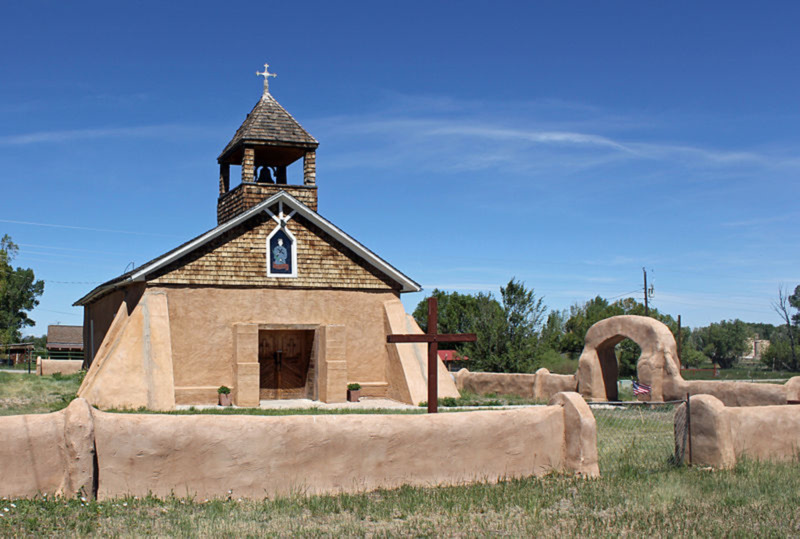 Butterfly grew up fourth generation on a farm on the Colorado Plains, where sky and dreams were both huge. 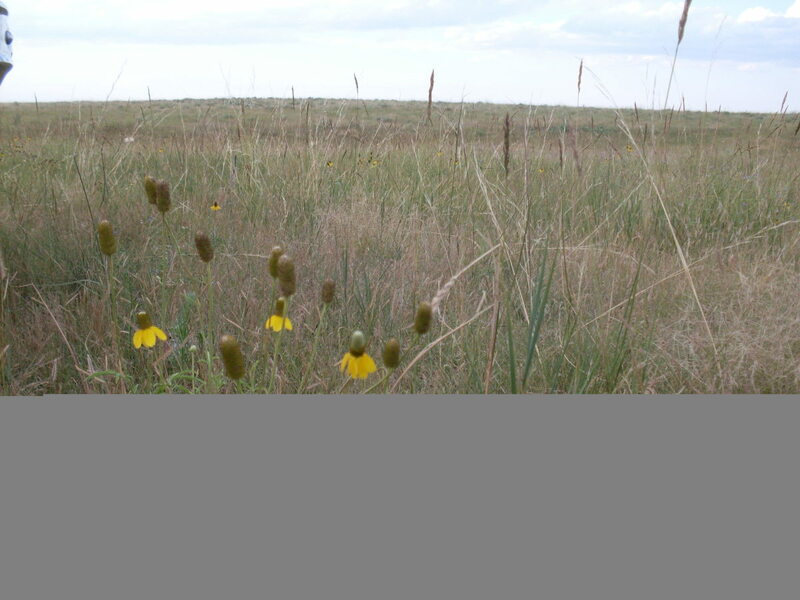 Many kinds of wild flowers grow in the pasture near the Buffalo Wallow. Wide open spaces - the back yard I grew up playing in. 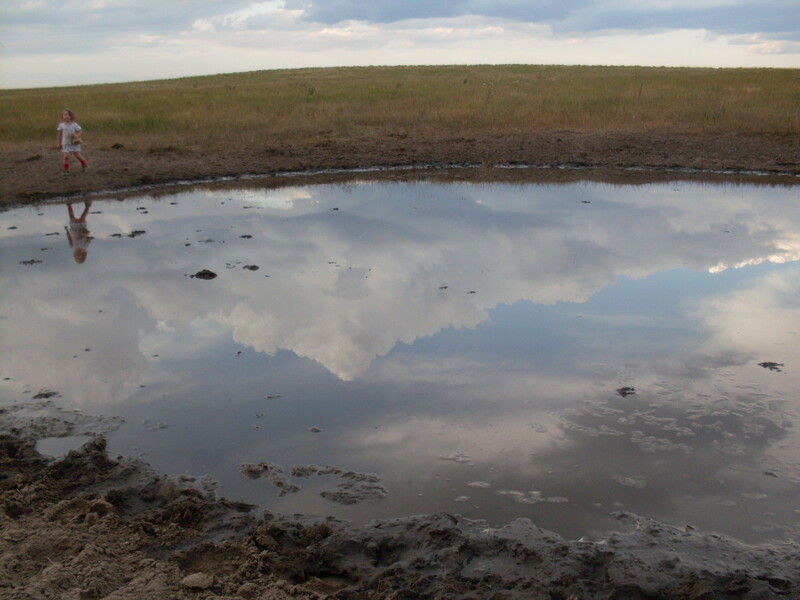 While growing up on a farm in Colorado, there was a special place in the pasture, which we called the Buffalo Wallow. This was but a low spot where rainwater collected, forming a bit of a pond in particularly wet years, and a trodden, sometimes muddy spot in dryer ones. It was magical for my siblings and I, because it was the only place within miles in which to wade. In the best years, it was full of eggs, which hatched into frogs, toads, and tiger salamanders. Once, it got waist deep...to a 10 year old. That year, we raised thousands of frogs and a handful of salamanders, in a stock tank in which we dumped eggs collected from the Buffalo Wallow. We assumed, because we had one, that everyone knew what a Buffalo Wallow was. But I found out as I grew that most people don't. So I'll show you. 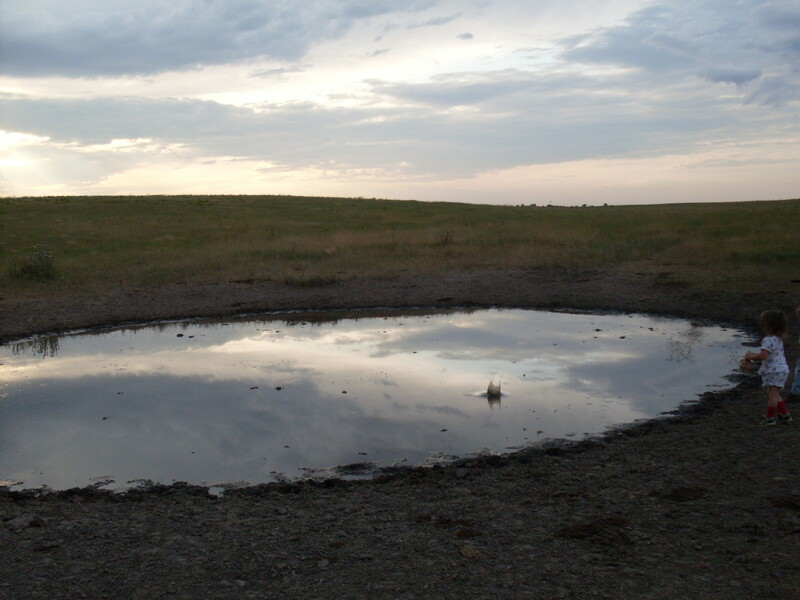 This is the Buffalo Wallow, in September 2009. There was no water in it, and the mud had dried. It is called a wallow because the bison who came through the area would roll in it to get away from the insects and to cool themselves. 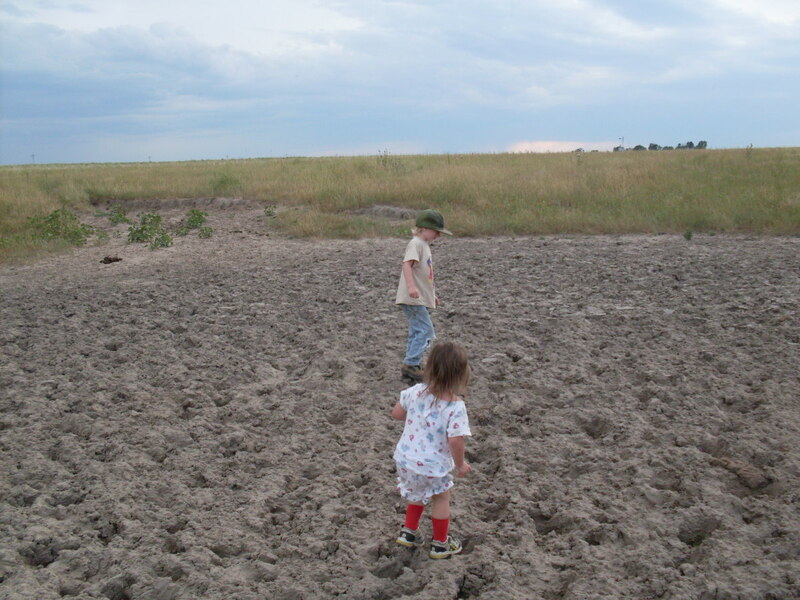 While it was wet, Dad's cows slopped through the wallow and enjoyed it, and now, my children take their turn. While not exactly a lake, it is big enough to have fun in! It's also a great place from which to watch sunsets. ...but I remembered another hole at which the cows came to drink and wade, and found it full. As it was growing dark, I wasn't about to let my daughter get all wet...but it was tempting for us both. Until I thought about the quality of the water, that is. :) The cows had been wading already, all summer. But it proved a fine place for throwing stones. We plan to be back next spring, and perhaps collect some tadpole eggs (mostly toads). 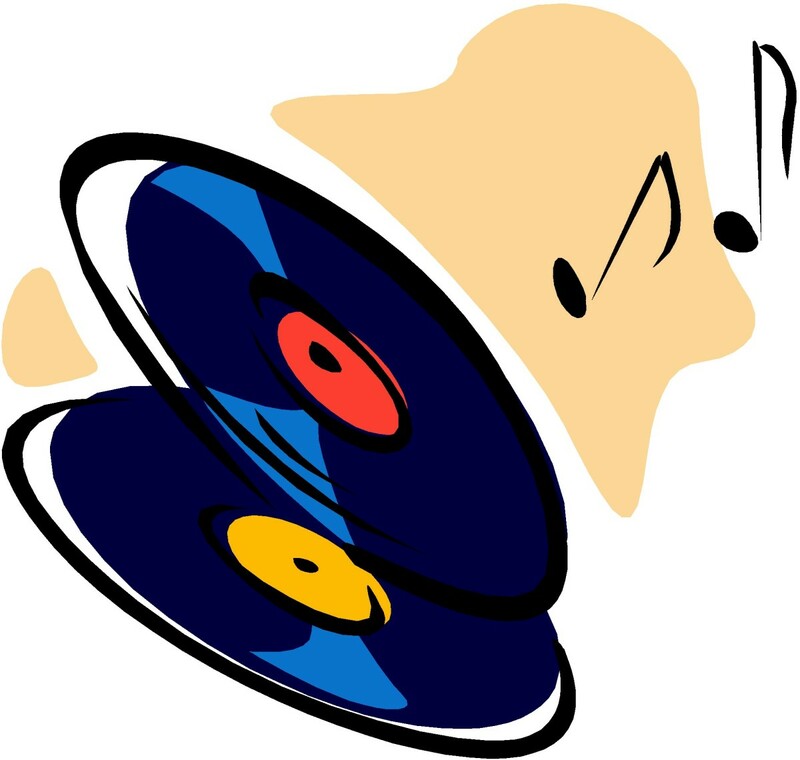 Mr. Wagner, thank you for your most instructive comments. 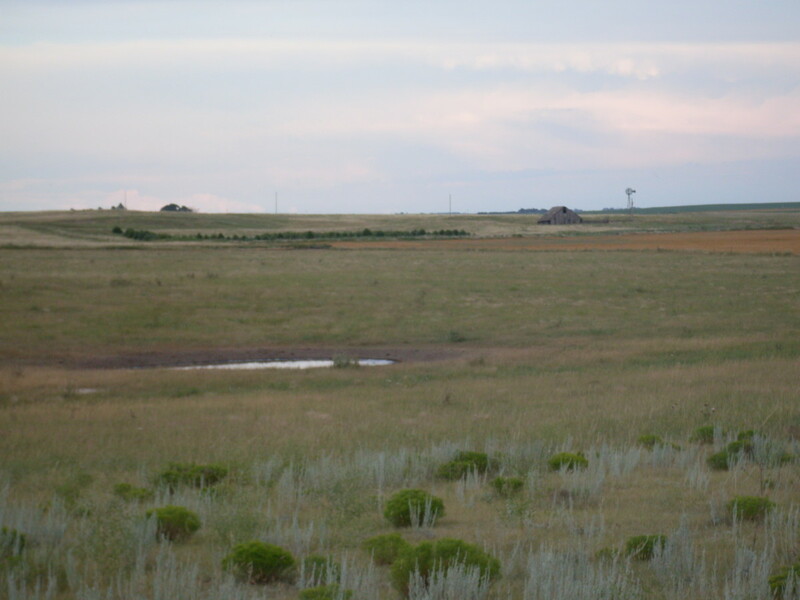 A buffalo wallow is a natural topological depression in the flat prairie land that holds rain water and runoff. 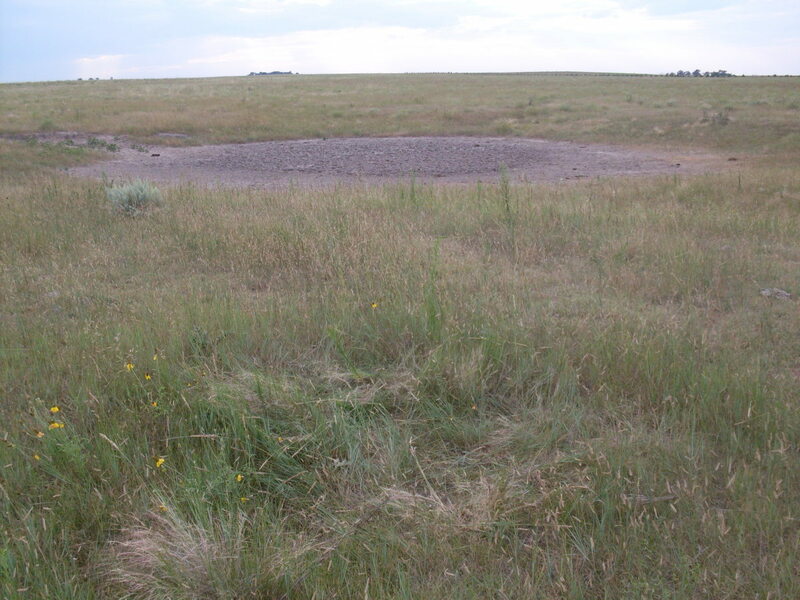 Originally this would have served as a temporary watering hole for wildlife, including the North American buffalo. Wallowing buffalo that drank from and bathed in these naturally occurring shallow water holes gradually changed the pristine watering hole into a buffalo wallow. 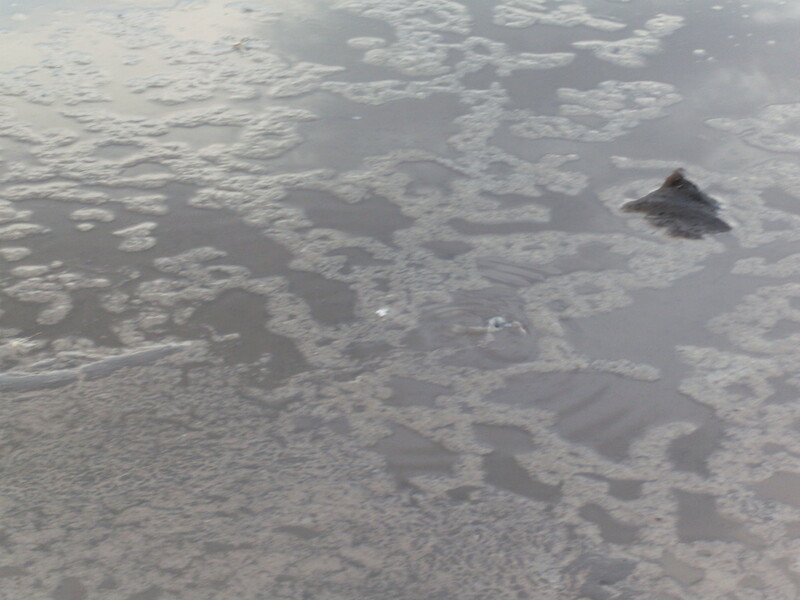 Wallowing action caused abrasion of hair, natural body oils and cellular debris from their hides and left the debris in the water and especially in the soil after the water evaporated. Every year the debris accumulated in the soil in increasing concentration and formed a water impenetrable later that prevented the rain water and runoff from percolating into the lower layers of the soil. 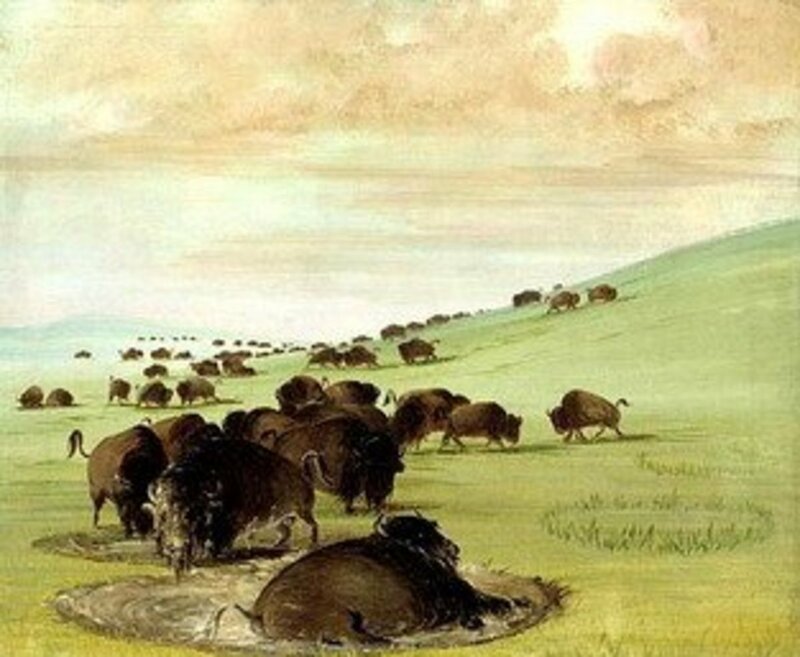 Ultimately the water remained for long periods which attracted more wildlife, especially criters from the thriving buffalo herds that roamed and grazed the great prairies of North America for thousands of years. Interestingly, they left few permanent markings on the landscape to mark their past presence. 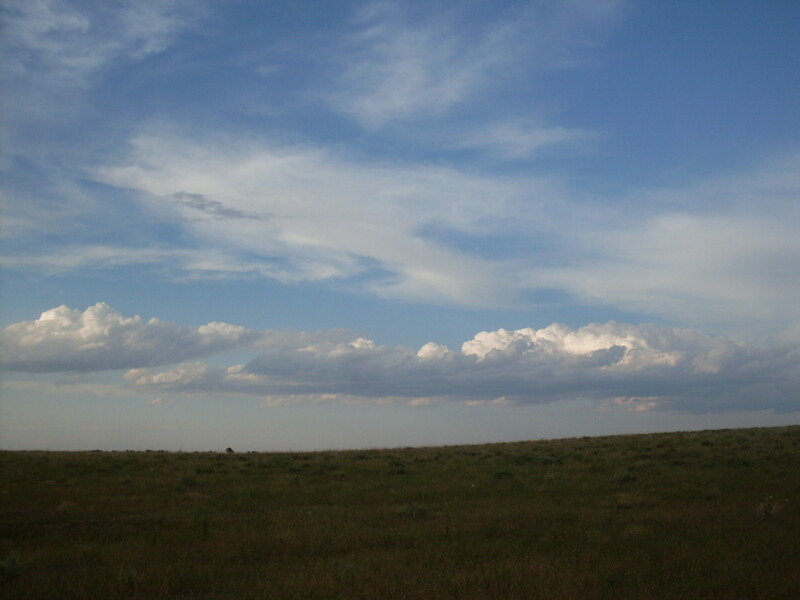 Exceptions are the somewhat rare yet still visible ancient buffalo wallows found occasionally on the North American praire flatlands. 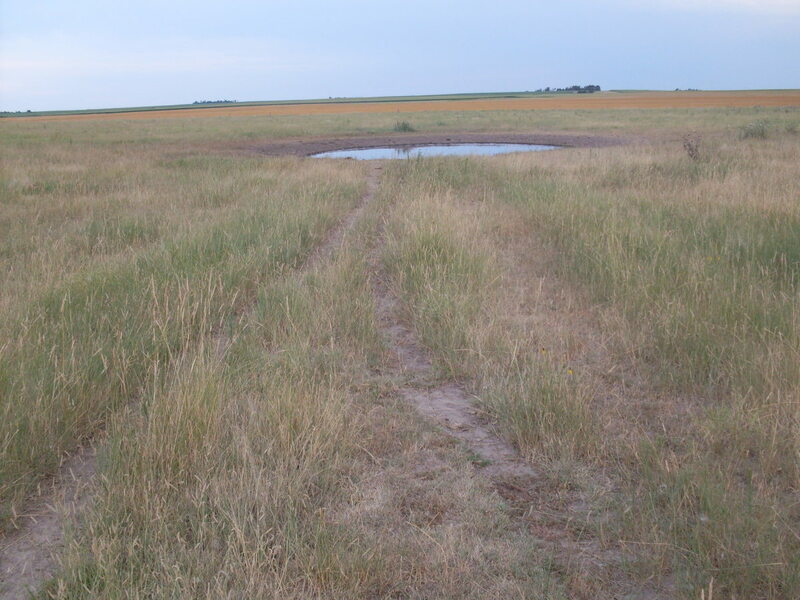 There are two (one large and one small) buffalo wallows on private land SW (1.2 m W and 1.1 mi S)of Willowdale Ks. in the wheat field. In wet years, they will stand water for weeks and a wheat combine will leave deep tracks in the mud and likely get stuck in them during wheat harvest. Such happened to me just prior to a thunderstorm in the 1960's. 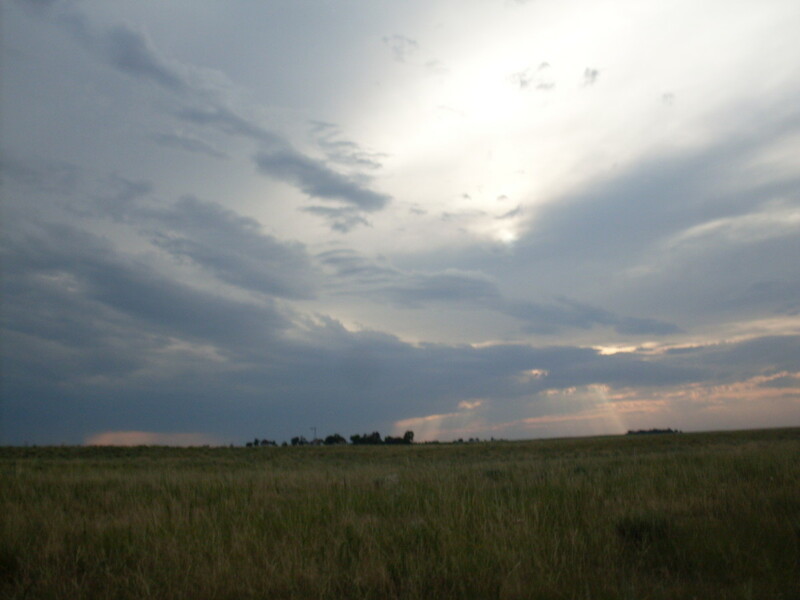 There I was stranded when tornadoes dropped out of the clouds to the SW. I thought I might not survive, but the tornadoes bypassed us. I'll never forget that day. You failed to explain that the buffalo wallow is usually a natural depression in an otherwise flat area and holds water because the oils from the buffalo hides mixed into the soil. This attracted the buffalo to return to water and bath. On hot summer days this helped the buffalo cool themselves as the water evaporated from their bodies. 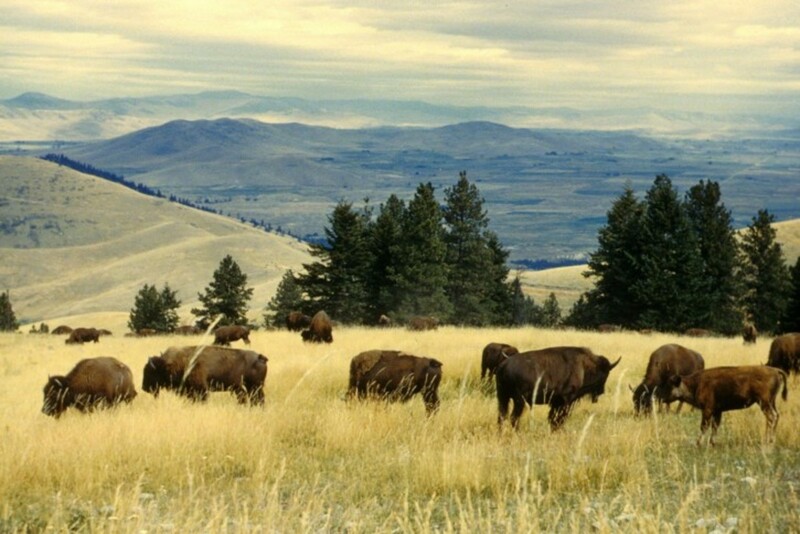 These may be the only markings on the landscape left by the buffalo and may date back for thousands of years. 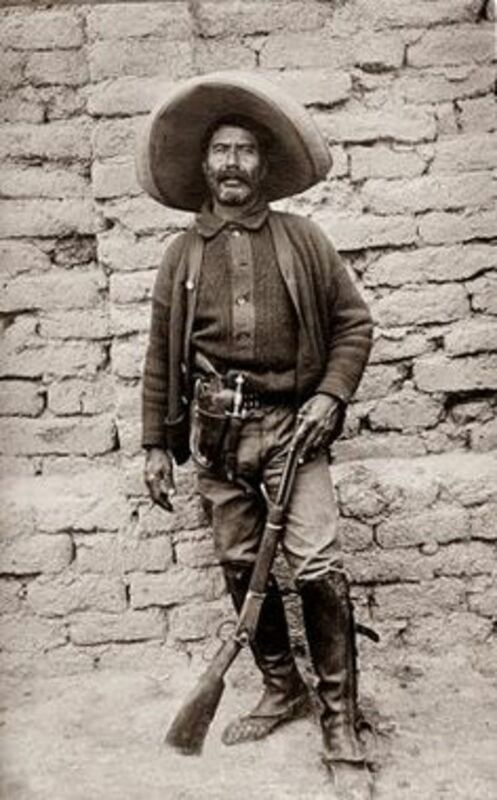 Surely the Indian buffalo hunters noted and remembered the locations of these rare locations on the plains. Thanks for sharing your photos and story. Thank you for your kind remarks on my photography. 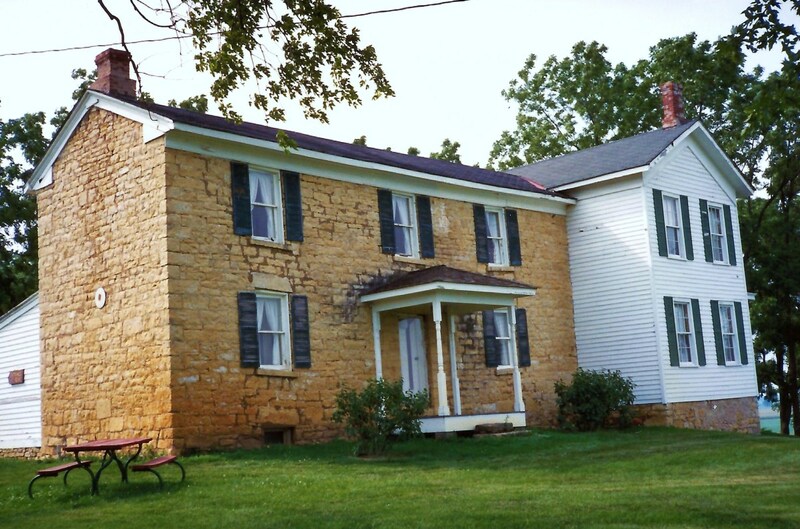 My siblings and I used to walk out to that barn, pretending we were a great ways from home (you couldn't see our place from there, as the ground was just hilly enough), and we had a fun time trying to catch the little lizards that showed up some years in that corner of the pasture. I want to get photos of some of the other old barns and houses in this area, as they have a great feeling of secrets ready to burst out, or be lost. 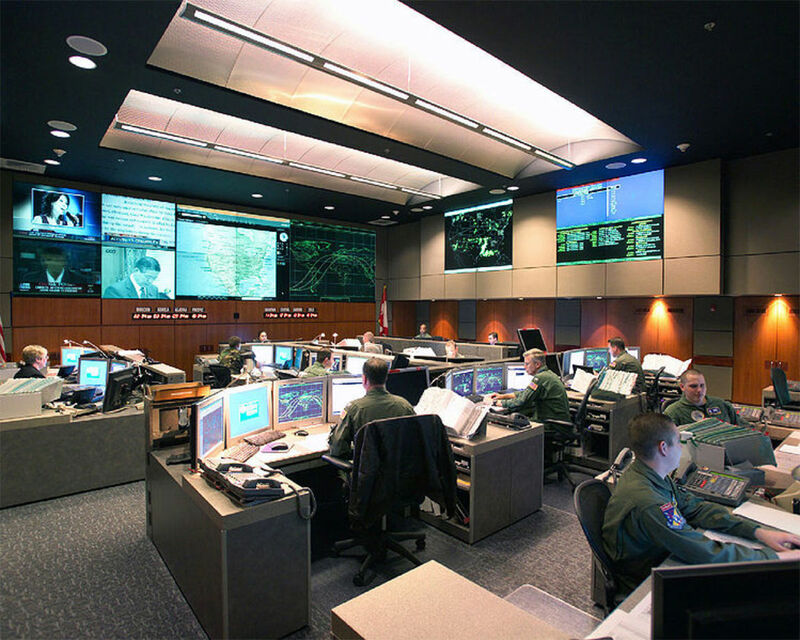 I think maybe I can find out some of those secrets, by listening intently to the walls and fields. It's worth a try, anyway. Lovely! I particularly liked the photo with the barn and the windmill off in the distance. When I see photos such as this, I always think what a wild and free life those people must live. The wide open spaces are beyond compare. Fastfreta, you always have something uplifting to say. Thank you. I'm afraid I haven't been nearly as faithful reading your hubs on time as you have mine, but I'll catch up one of these days. I so enjoy seeing your smile. Aw, that was cute. I can't identify with this, but I enjoyed it. Thanks for sharing you fond memories. We did get a lot of rain last year, but the main thing was we never reached our normal summer temperatures. I kept thinking about in the book "Farmer Boy" when they had frost on the 4th of July. Of course, that was in northern New York State. Still, it never really warmed up. The grass looked great, the corn looked horrible. You can never have it all, I guess. Waist high near the sand holes? I think I only saw that one summer, when I was about 14. It was the year we had over 20 inches of rain. There was magic everyday. Justine, you are wonderful! Your comment uplifted my heart. Ivorwen, I'm sorry to make you so homesick. That was not my intention. Last year was really wonderful, as far as the quality of the grass...when was the last time you saw it waist high near the blow sand holes? I had a lot of fun taking these pictures. It was hard to choose which to use for this hub. You know as well as I that sunsets here are often grand, but this one was magnificent. The lighting was magical for about two hours. Ralwus, I'm so glad I could bring a smile to your face! Yes, when I stop to think about it, I realize how exceptional my life is, and I send up prayers of thanksgiving. Really, don't worry about what some may say, your pictures are beautiful!! ButterflyWings, your making me homesick! 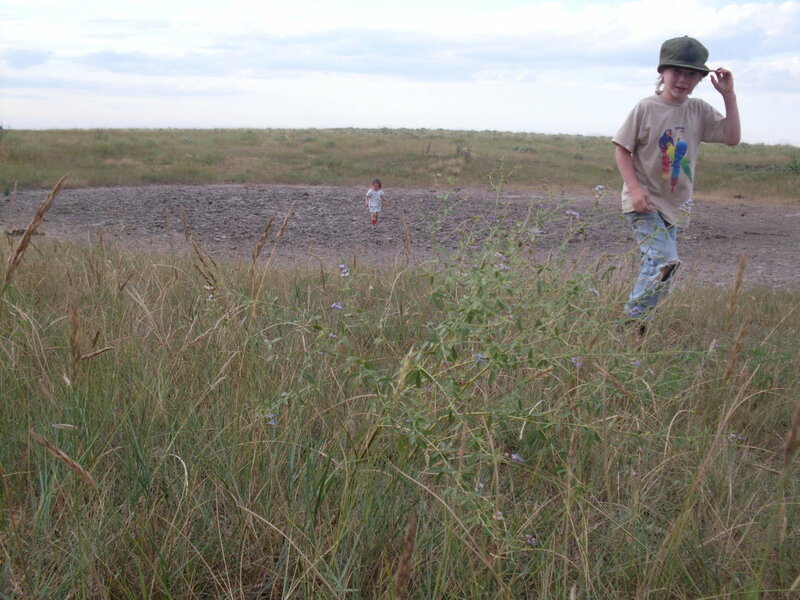 I miss all that tall dry grass, and those lovely little water holes in the pasture. Thank you for sharing these lovely pictures. That one of Tyra reflecting in the small wallow is fantastic.